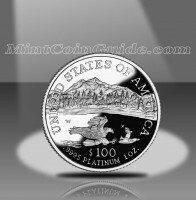 The 2002 American Platinum Eagle Coins reversed the trends of the previous year with declining bullion mintages but improved Proof Eagle numbers. Platinum prices were significantly lower during the first portion of the year before slowing showing improvement by the latter half of the year. Still, the precious metal only ended up averaging $539.13 for the year, up $10.09 from 2001. The reverse of the Proof Platinum Eagles contained the last five special "Vistas of Liberty" designs. The bullion Eagles retained the same soaring eagle design as had been on the investment grade coins since their debut in 1997. Bullion Eagle mintage slipped significantly during the year to end up at only 85% of the level seen in 2001. The decline was led by a sharp decrease in the number of 1/10 ounce Bullion Eagles. Proof Platinum Eagle mintage increased for the year showing a 5.2% jump. Leading the pack was an improvement seen in the numbers of the one ounce strikes. The chart below shows the total mintage of 2002-dated Proof Platinum Eagles which includes the number sold as part of the Platinum Eagle 4-Coin Set (of which 6,762 were sold). The 2002 Platinum Eagles marked the sixth year for the program from the United States Mint. Proof Eagles were released by the US Mint on August 5, 2002, two months later in the year than the strikes were available in 2001. Bullion Platinum Eagles were available from the Mint’s network of authorized purchasers for most of the year. 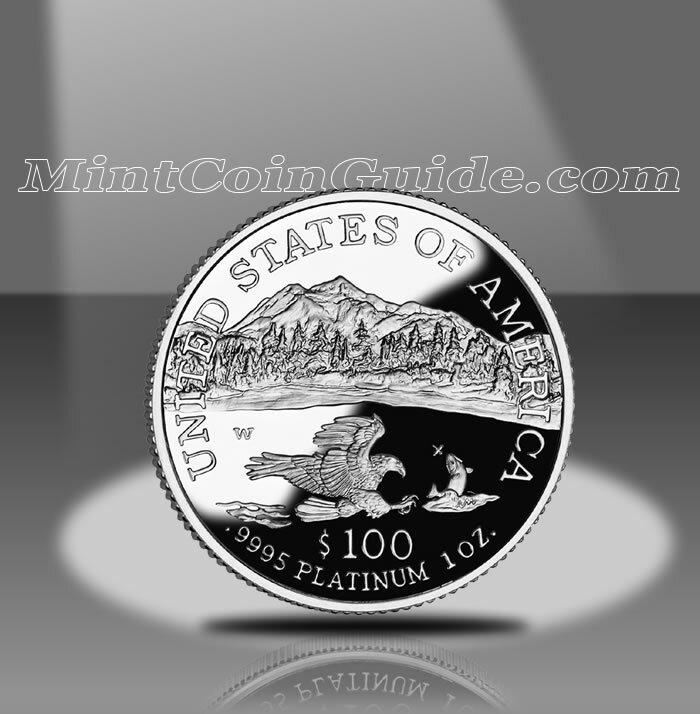 The Mint retained the same pricing for the Platinum Proof Eagles as it had charged the previous two years – $740 for the One Ounce Proof, $405 for the 1/2 Ounce Proof, $227 for the 1/4 Ounce Proof, $118 for the 1/10 Ounce Proof and $1,375 for the 4-Coin Set. 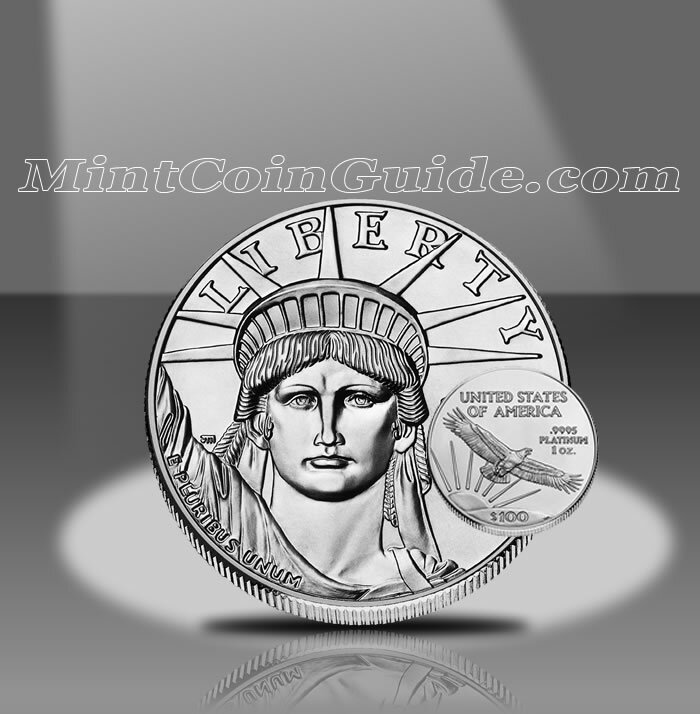 The Mint’s network of authorized purchasers sold the bullion Eagles for a small premium above the current spot price of the platinum contained within them. United States Mint sculptor-engraver Al Maletsky’s proof reverse design shows a classic northwest United States landscape with a mountain lake and snow-capped mountains and trees. About to latch onto a fish in the lake, a flying eagle is shown. A ‘W’ mintmark on each Proof Platinum Eagle indicates it was struck at the US Mint’s facility in West Point. John Mercanti designed the "Portrait of Liberty" that is featured on the obverse (heads side) of all of the Platinum Eagles. The reverse (tails side) of the bullion Platinum Eagles contains Thomas D. Rogers Sr.’s soaring eagle design. The Proof Platinum Eagle reverse is the fifth of five annual reverse designs that were part of the "Vistas of Liberty" series and shows a northwest United States landscape with a mountain lake and snow-capped trees and mountains. A flying eagle is shown on the design about to catch a fish in the lake.